CIRCA stands for "Contents Insurance Residential Cost Address" database and is the latest offering in the expanding Sum Insured product range. 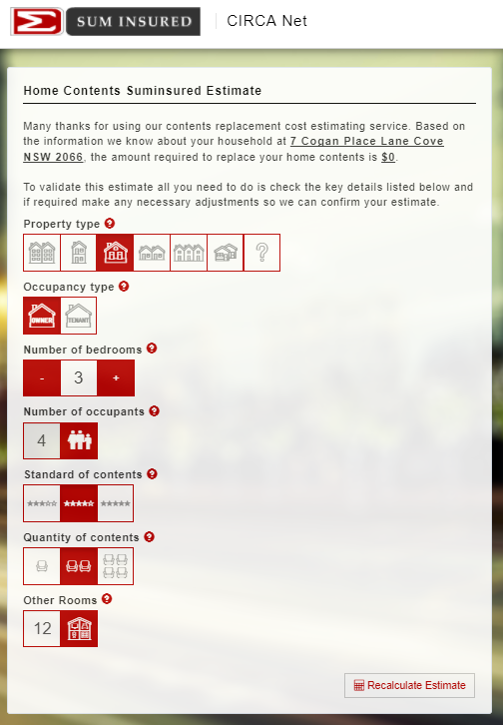 CIRCA combines contents replacement cost information with property & household data, to provide an automatic home contents sum insured replacement cost for any property within Australia at the individual address level. Sum Insured’s CIRCA database contains information on the property type (i.e. home or unit), whether the property is owner occupied or tenanted, the number of bedrooms and other rooms, the number of occupants, standard of contents and of course the estimated replacement cost of the homes contents. CIRCA simplifies & speeds up the contents quoting process, reduces quote drop outs and improves sales conversion, whilst at the same time improving the overall user experience and reducing call centre handling times. It also reduces the instance of home contents underinsurance. CIRCA is available as a fully customisable web based standalone white label calculator or alternatively is available thru an API.